H&A Mud is specially formulated using an organic material and a water based adhesive to give you the easiest to use and most realistic looking mud on the market. H&A mud can be mixed with warm water and applied with brush or spatula. It can be used to simulate mud on tires or undercarriages. Special effects such as splattered or splashed mud are easy to achieve as well as other mud effects. 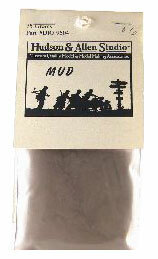 H&A mud can be used right out of the package as a weathering agent on wheels, tracks, fenders, or other areas where dust may accumulate. Clear coating is not necessary.